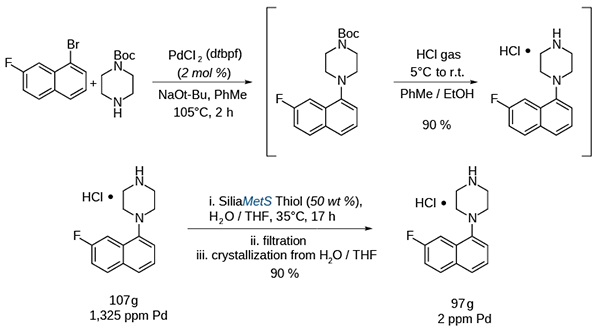 SiliaMetS Thiol was employed by researchers at Pﬁzer for Pd removal during the preparation of a naphthalenopiperazine HCl salt. The product from the Buchwald-Hartwig amination of naphthyl bromide with Boc-piperazine was telescoped as a toluene solution and the Boc protecting group was subsequently cleaved with HCl gas to afford the HCl salt containing over 1,300 ppm Pd. A water / THF solution of this material was then treated with SiliaMetS Thiol (50 wt %) at 35°C for 17 h and, following crystallization from water / THF. The HCl salt was obtained with a 90 % yield and with only 2 ppm Pd. This chemistry was demonstrated on a kilogram scale. Our most versatile and robust metal scavenger for a variety of metals under a wide range of conditions.